Have you ever been working or turning away on a piece of wood and thought “Something’s wrong here, perhaps I’m not in the right mood or maybe the tools need a touch up”? The tools are sharp when you check them but you’re struggling to get a decent finish. If so then the chances are that you are trying to work a piece of REACTION WOOD and quite often you will only realize this after the piece has already proven troublesome. 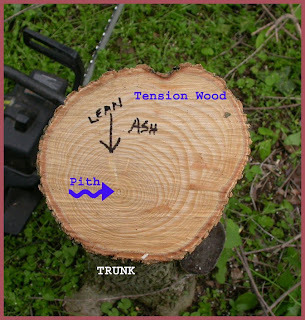 Reaction wood is wood altered as a response to a lean and is present in every branch. It differs greatly from normal wood. In hardwoods, cell walls thicken on the upside of the lean or top of a branch. An off-centre pith is a dead giveaway. 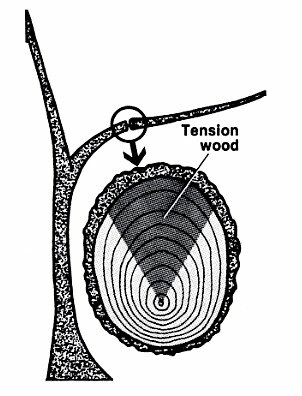 This reaction wood is called tension wood. Tension wood forms above the affected part of the tree, pulling it up. It has a high cellulose content, which means that the fibres will lift quite easily and the wood will be more difficult to turn or work. When fibres lift the wood takes on a wooly texture and tends to produce a fuzzy surface especially when worked green. To make matters interesting reaction wood in conifers (softwoods) forms thicker growth rings with thicker cell walls on the down side of the lean or underside of a branch. In conifers it is called compression wood and is rich in lignin. In an ideal world we would be working nice straight-grained, knot-free timber which had been harvested from a forest where the trees are evenly spaced, drawing each other up, forming a closed canopy and shading out lower branches. When I was a tree surgeon and starting out green woodworking I used mainly wood from gardens and often struggled with bits of branchwood and leaning trunkwood until I realised what was going on. I remember well one particular batch of Horse Chestnut (Aesculus) which was like trying to turn a marshmallow! The bottom part of a hardwood branch (called, I think, opposite wood) actually works quite well but there is a natural tendency to go for the bigger ‘half’ - chuck it on the firewood heap. Of course branches, forks and crotches with natural bends are appealing to use for spoon carving - you just have to work out which bit is best and struggle and sharpen the tools. I am eternally grateful to the late, great Dr Alex Shigo for this knowledge. My first impressions of these knives was good. They are beautifully made and the chunky handles which are a similar shape to Flexcut carving knives gave a good positive feel for me as I’ve got fairly big hands. I found that I used a more relaxed grip and didn’t suffer the agonising pins-and-needles and numb fingers that I usually get when using knives with small handles. Others might not find them so but I read in one of James Krenov’s books about ergonomics that you shouldn’t be afraid to customize your tool handles to fit your hand - carve bits off or even glue bits on to them. I loved using these knives especially the two on the right. The shape of the blades is quite subtle and clever. At first I thought they were too thin but in use this proved to be unfounded. There always seems to be part of the curve which matches the part of the bowl of the spoon you’re working on. I felt as though my technique changed after using them for a while and when I went back to the Djarvs, Orfords and Frosts they felt a bit crude and insensitive in comparison. The carving knife grew on me as I used it. Not that different to my Frost 106 but I found myself reaching for this one in preference. The shallow curve knife 2nd from left I didn’t really make friends with - it has a kind of crook knife quality and I already have one of Ben Orford’s crook knives which I never use. I tried the knives on quite a variety of woods:- Holly, Hawthorn, Beech, Birch, Cherry and Laburnum. The Laburnum spoonula was bought the day after I made it by a lady who came on a course. I hadn’t even finished roughing it out properly, it still had pencil marks on it and she happily paid £30. Sharpening is an issue that is going to arise in this passaround ie. peoples levels of sharpening skill and expectations and definitions of sharpness. The shallow curve knife had quite a big dink and a wire edge on the inside of the curve when I got it. Although I spent a fair while fettling I wasn’t able to completely sort this out and it still wrote its name with every cut. The 35mm film canisters to protect the blades is a good simple idea but they must be getting quite rare now that nearly everyone uses digital cameras. Jed took a fancy to one and I found him having a chew on it behind a bush! I don’t know if you’re going into production Duncan but as you can probably tell I was impressed with these knives and wouldn’t mind investing in some - please email me with price, availability etc. Happily I’m not one of those who has to ‘sneak in tools past the wife’ as some unlucky people do. Vanessa actively encourages me to buy good tools and after all she knows that “He who dies with most tools wins”. To read other reviews as they come in click here. 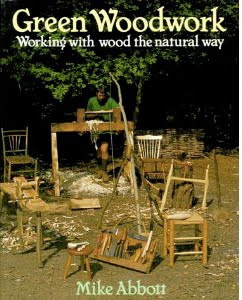 Had a great time in Glebe Woods yesterday running a workshop for 5 new and enthusiastic green woodworkers. It is 8.5 acres of Chestnut & Hazel coppice with Oak Standards - definitely the best place for bodging. Chris had cut some overstood Chestnut and Hazel so there was loads of raw material and I bought some nice logs away with me ready for next weekend's demo at Burghley. ...and a live coppice shoot for this one. A lot of concentration is required when using an axe for the first time. Really looking forward to going up to Chris Southall's wood near Clacton today where we're going to run a workshop for him and some of his mates tomorrow. I'll take the Spoon Knife set for them to have a try with as well as my own set. Joy and Mark came yesterday and she managed to carve 2 small spoons for her babies. She also bought, among other things, this Laburnum spoon/spatula which I had only just made and hadn't yet finished (I think it still had some pencil marks on it!). They are part of the "Monty Don Effect" and were amazed to find someone giving Green Woodwork tuition in the next road! Mark is really into his cabinet making and carving and has a good understanding of tools and a high skill level - the dibber he made had an excellent finish. He wants to make a Jennie Alexander style chair and I suggested he first come and make a frame stool as a good starting point. I'm posting these here because they haven't yet appeared on my website. I'll be demonstrating at all of these events and will have a good range of treen, stools and second hand woodworking tools for sale. Anyone interested in green woodwork tuition please look at my website. 16th Ely Apple Day, Cambridgeshire. Came across these piles of freshly felled Birch logs at Rushey Plain in the Forest - they'll be left to rot. I asked one of the gang doing the work what was going on. "We're restoring it to how it used to be" he said!!!! Shirley & Jon Warbrick who've had fun in the garden on a lovely day playing about with shavehorses and lathes etc. Someone I only know as Duncan has made a set of spoon carving knives and a passaround has been organised on the Bodger's forum. The idea is that each person has them to try for a week and then sends them on to the next one on the list and posts a review of their thoughts on them. Well they arrived the other day and so far I've only had time to make one sort of spoon/scoop hybrid from Holly with a turned handle but first impressions were very good. I was at the Register of Professional Turners annual Craft Meeting up in London yesterday and I've got a couple coming on a course tomorrow so hopefully I'll be able to give them a good work-out on Sunday - blimey doesn't a week go by quickly? Spotted the first Beech leaves popping their buds in a sunny glade in Loughton Camp yesterday. ...after last year's heavy crop of nuts (mast). Someone had made a couple of swings at the edge of the "Lost" Pond when we turned up there on a forest ramble the other day. A family also turned up for a go, a bunch of kids were climbing on a fallen tree on the other side of the pond - all whooping and hollering - then a large group of ramblers appeared and stopped nearby to eat their lunch. It was quite exhilarating, like a forest party and all in a place where we rarely encounter a soul! 2 Johns, Angela & Gary. I set up my bowl lathe for only the second time and realised it needs a bit of serious tweaking. The bobbin affair just didn't have enough oomph for the big beech blank I was trying to turn, I think a spring pole is definitely in order, and the treadle needs serious consideration. Also the legs are a bit too long. John had set a nicely designed little wooden vice into the end of the bed on his lathe, perfect for holding the hook tools for sharpening and touching up. Thanks John, think I'll have one too! This is Tim, a graphic designer from Walthamstow, who booked a course here yesterday after having seen the Mastercrafts programme. I nearly always start off with an Ash dibber as it's fairly easy, contains all the elements required in spindle turning and they have something useful to take home. He also had a go at turning a ball in holly and seemed quite adept with the skew chisel. Anyway he enjoyed it, got bitten by the bug and signed up for another day next month to perhaps try some bowl turning. I first became aware of the term ‘Bodger’ back in 1993 when I was studying for my arboriculture exams. I wrote off to loads of organisations and one of the things I got back was a copy of the Bodger’s Gazette - quite an endearing little rag produced with typewriter and photocopier. It seemed wacky and highly esoteric that a newspaper was being produced specially for guys who beavered away on their foot operated lathes deep in the woods and forests. I qualified and became a tree surgeon and had no more contact with Bodgers for several years until I got sick of seeing all the wonderful timber we had cut going for firewood and landfill. I looked for ways of using it and as I had studied Fine Art tried doing some carvings and sculptures but that didn’t feel right. I cut my arm quite badly with the chainsaw and whilst I was recuperating a friend suggested going to the APF demo up in Staffordshire. We were walking around looking at chainsaws, chippers, ropes and harnesses etc and then we turned a corner and in a little glade was a chap with some weird but intriguing contraptions and tools, a pile of logs, some chairs, stools and other things he’d made and a book for sale called Green Woodwork. What I was looking at was exactly like the cover of the book. I got excited and realised that I’d come across a real live Bodger and a way of using up some of those logs I had. I chatted to Mike for a while, bought a copy of the book and when I found out he ran courses signed up to make a shavehorse. Then I made a lathe and would bring home a different type of wood every day to try out and practise on all the while poring over the book until I practically knew it by heart. In 2000 I was made redundant and as I had made a load of items by then decided to try and turn my hobby into my job. I went back to Mike and made a Windsor chair thinking that I would become a chairmaker. In fact that experience with him put me off that idea completely so we started to attend Farmer’s Markets as producers offering firewood, kindling, garden stakes, knife and tool sharpening, rehandling and second hand woodworking tools as well as my stools, spoons, treen etc. Then people started asking if I would do paid demonstrations of the craft and I began running my own courses. At first I called my business Wood Works but when I realised that others were operating under the same name changed it to Treewright which is meaningless really (although Will Wall told me that Saxon house builders were called treewrights) and my webmaster, Oliver, informed me that it was a good domain name when he set up my website. He also advised me to set up this blog to increase my profile on the web and to try and divert some traffic to my website. 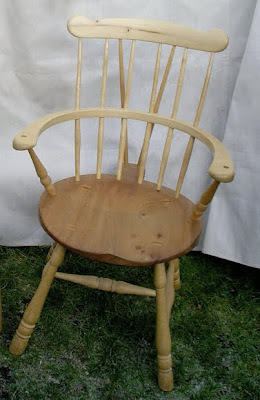 I called it “A Bodger’s Blog” because I thought it was an interesting title and folk would be curious to find out more. I am a moderator and frequent contributor to the Bodger’s Forum and still receive the Bodger’s Gazette once every quarter. I attend the Bodger’s Ball every year where as many as want to meet up somewhere in the country for fun, competitions, chat, beer, workshops, tools, music etc. NOW - there are moves afoot to have a rebranding exercise and get rid of this apparently awful, embarrasing and silly word “BODGER” as it may be putting people off from getting involved with us and giving the wrong impression (I’d like to see the evidence for this). Apparently if we want to be taken seriously as craftsman we must start to call ourselves a “GREEN WOODWORKER” - a term coined 30 or so years ago by John Alexander or Jennie as he now likes to be known. If you type Bodger into Wikipedia you get quite a lot of information and pictures but there are some quite contentious statements and whoever wrote the article was a bit confused as they say that bodger and botcher are synonymous then go on to state that “A "bodged" DIY job is serviceable: a "botched" DIY one most certainly is not - but a total failure.” ! If you type Green Woodworker into Wiki you get little information, no mention of John (Jennie) Alexander and a link to a page about green woodworking tools which is being considered for deletion. I think more people understand Bodger in it’s woodworking sense than are given credit for. Most Radio 4 listeners will be familiar with the word as there was a Bodger in the Archers not that long ago - apparently you could hear the ‘razzle’ of the gouge on the fresh wood in the background. There have been numerous mentions of Bodgers on telly. I’ve seen Gudrun Leitz, Stewart King & Ted Tuddenham and Malcolm Lee on various shows in the last year. Prince Charles has tried his hand at bodging which you can see here. 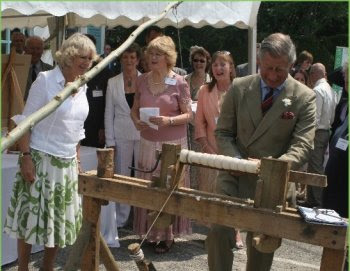 Prince Harry had a go on Lois Orford’s lathe at the Royal Norfolk Show. As I said I find it an endearing term and I don’t mind chatting with folk and educating them about it’s real meaning (ie the guys who worked in the Chiltern beechwoods making chair parts for the factories at High Wycombe) and discussing the etymology of the term. Most people think a Bodger is someone who carries out a task badly or carelessly which I think is a corruption of the word Botcher. The Bodgers were highly skilled craftsmen. The men working in the woods may have been called Botchers by those who worked in the factories who looked down on them. It may be a corruption of the word Beech -er or Birch -er, both woods that would commonly have been worked. Another theory is that bodger was a corruption of badger, as similarly to the behaviour of a badger, the bodger dwelt in the woods and seldom emerged until evenings. Some say it is a relatively new word possibly invented by a journalist in 1910 (any proof of this?). There are probably loads more but whatever the answer it is shrouded in mystery and controversy. Words change meanings over time, take “gay” for instance. When I was a kid it meant happy and colourful, now it describes someone’s sexuality. You may have noticed at the beginning of this I mentioned Arboriculture - not many people know that this refers to work on amenity trees in streets, gardens and parks but they understand what I do if I say “Tree Surgeon” - what a misnomer! People think you’re going to inject their tree with a giant hypodermic or perform an operation to make it better. Real surgeons have to study for 7 years - anyone can pick up a chainsaw and call themselves a “Tree Surgeon”. The term Green Woodworker is too general, it says nothing, it’s dry, technical and there’s no mystery or romance about it. OK it describes what many people do but you’re still going to have to explain exactly what it is you do to those not in the know. I consider the Bodging process to be splitting, chopping, shaving and turning on a pole lathe to make spindles of some kind wether they be chair legs, spurtles, honey drizzlers, rolling pins or spinning tops which is what I do... So I must be a Bodger... I find it quite endearing and laugh at the negative connotations. I certainly won’t be changing the title of my blog and I’ll continue to attend the Bodger’s Ball. This might not be a brilliantly well reasoned arguement but it is an impassioned plea to save a word from misuse and disuse - it’s not just crafts that need saving from slipping into obscurity and so far I seem to be the only one bigging it up. I feel that the two terms could continue to peacefully co-exist. So come on... Bodgers of the World Unite! I’d be very pleased to hear other ideas and thoughts from anyone who reads this.